This is according to Minister of Government Reform Lovitta Foggo who provided an update in the House of Assembly today [Oct 20], saying: “This Government committed to implement the SAGE Commission’s recommendation to establish three permanent Parliamentary Oversight Committees in order to improve governance, reduce waste and increase efficiency. “The establishment of a parliamentary committee is a matter for the Speaker and not for the policymakers,” the Minister said, adding that, “The Ministry of the Cabinet Office with responsibility for Government Reform is committed to working with the Legislature to ensure that these committees are realised. “The now strengthened Ministerial Code of Conduct seeks to ensure complete transparency,” she said. “More rigid disclosure requirements for Ministers have been established. “Ministers have historically been required to surrender only gifts valued in excess of $250, however Ministers have not traditionally been required to disclose gifts of a lesser value. “The now amended Ministerial Code of Conduct, which is expected to be tabled for information in this Honourable House in the coming weeks, requires a Minister, as soon as possible after the receipt of all gifts of any value, to disclose the gift to the Permanent Secretary. “Further, a Minister will also be required to disclose all hospitality from any source which might reasonably be thought to influence Ministerial action in any manner. “For example, Honourable Members will recall instances where private air transportation and complimentary high-end dinners to discuss potential business, such as casinos or gaming, were accepted by a previous administration. The amended Code requires that a Minister must immediately disclose such hospitality. “An official disclosure form will be created and distributed electronically to each Minister and Ministry to ensure that this mandate is operationalized. Minister Foggo also said the Code of Project Management and Procurement has been now been finalized and will be tabled in the House for information in the coming weeks, with the Code setting out the requirements and procedures for the procurement of goods and services. “The Code is reflective of the Government’s commitment to improve good governance standards and to use its purchasing power to create opportunities for historically disadvantaged groups. To this end, preference in the awarding of contracts will be given to small and medium-sized businesses and business with a well-established Bermudian employment base. “A provision for unsolicited proposals has therefore been incorporated into the policy,” Minister Foggo said. “Such a provision seeks to increase transparency and ensure fairness in the handling of unsolicited proposals. I rise this morning to inform this Honourable House of the progress made towards laying the foundation for Government Reform. Mr. Speaker, reform is all about modernization and change. And this Government’s goal is to enact substantive and meaningful changes for the betterment of Bermuda. To this end the Ministry of the Cabinet Office with responsibility for Government Reform has started to build the foundation for change within the Government on a framework of accountability, collaboration, transparency, and integrity. Mr. Speaker, demands to modernise the Government requires a strengthening of the leadership by empowering the Legislature to have a more robust role. Mr. Speaker, as you are aware, aside from passing laws, one of the functions of the Legislature is to scrutinize Government operations and administration. Such scrutiny and oversight by this Honourable House is an area that the former Government opted to reject. It is one of the many recommendations that were set aside. Mr. Speaker, honourable members will know that this Government committed to implement the SAGE Commission’s recommendation to establish three permanent Parliamentary Oversight Committees in order to improve governance, reduce waste and increase efficiency. Honourable Members will recognize however that the establishment of a parliamentary committee is a matter for the Speaker and not for the policymakers. Nonetheless in accordance with this commitment I can report that over the past few months I, in my capacity as the Minister for Cabinet Office with responsibility for Government Reform have become a fierce advocate for the establishment of these committees. Honourable Members should be aware that the Ministry of the Cabinet Office with responsibility for Government Reform is committed to working with the Legislature to ensure that these committees are realised. Mr. Speaker, the vision for these committees is such that it holds both Ministers and technical officers accountable to this Honourable House. It is envisaged that both Ministers and technical officers will be called before these committees to report on details related to programmes and policies that fall under their Ministerial remit. The Committees will be empowered to make recommendations that will support and inform programme and service delivery and the Government’s reform agenda. Mr. Speaker, the aim is to hold Ministers accountable at all levels. Therefore, the Ministry of the Cabinet Office with Responsibility for Government Reform has worked in cooperation with the Office of the Premier to update the Ministerial Code of Conduct to ensure that Cabinet is held to the highest ethical standards. The now strengthened Ministerial Code of Conduct seeks to ensure complete transparency. In addition to the Register of Members’ Interests, more rigid disclosure requirements for Ministers have been established. Ministers have historically been required to surrender only gifts valued in excess of $250, however Ministers have not traditionally been required to disclose gifts of a lesser value. Mr. Speaker, the now amended Ministerial Code of Conduct, which is expected to be tabled for information in this Honourable House in the coming weeks, requires a Minister, as soon as possible after the receipt of all gifts of any value, to disclose the gift to the Permanent Secretary. 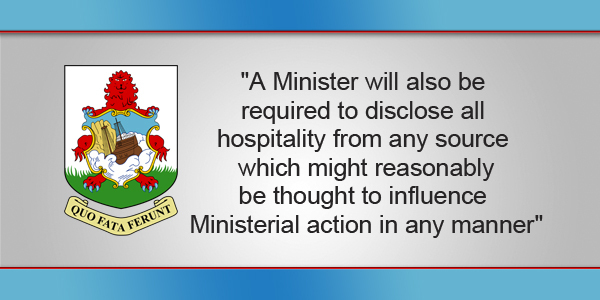 Further, a Minister will also be required to disclose all hospitality from any source which might reasonably be thought to influence Ministerial action in any manner. For example, Honourable Members will recall instances where private air transportation and complimentary high-end dinners to discuss potential business, such as casinos or gaming, were accepted by a previous administration. The amended Code requires that a Minister must immediately disclose such hospitality. An official disclosure form will be created and distributed electronically to each Minister and Ministry to ensure that this mandate is operationalized. Transparency and integrity in office are at the heart of this endeavour. Mr. Speaker, not only has the Ministerial Code of Conduct been updated but Ministers were required to participate in a training session, wherein the contents of the Ministerial Code of Conduct were presented and clarified as required. Ministerial briefings on the Ministerial Code of Conduct were supplemented with Ministerial briefings on Project Management and Procurement. Mr. Speaker, the Code of Project Management and Procurement has been now been finalized and will be tabled in this Honourable House for information in the coming weeks. Mr. Speaker, Honourable Members will be aware that the Code sets out the requirements and procedures for the procurement of goods and services for the Government that must be met and followed by all public officers. By complying with the Code, public officers will ensure that the Government’s procurement activities achieve the best value for money while being fair, ethical and transparent. Mr. Speaker, the Code is reflective of the Government’s commitment to improve good governance standards and to use its purchasing power to create opportunities for historically disadvantaged groups. To this end, preference in the awarding of contracts will be given to small and medium-sized businesses and business with a well-established Bermudian employment base. Mr. Speaker, the Code seeks to modernize Government procurement practices and stimulate innovation. A provision for unsolicited proposals has therefore been incorporated into the policy. Such a provision seeks to increase transparency and ensure fairness in the handling of unsolicited proposals. For instance, a process has been set out for the receipt and examination of proposals that are submitted to the Government such as the AeCon/CCC proposal to redevelop the airport. This will ensure that in the future any such proposals will be handled in a fair and transparent manner. Mr. Speaker, the supremacy of Cabinet in Bermuda’s system of government is a long-settled position. In recent years there has been a very public attempt to enjoin senior civil servants with Cabinet and to make them responsible for the decisions of Cabinet. This is fundamentally wrong and contrary to a core tenet of our style of government. Therefore, the Code contains a provision that recognizes the authority of the Cabinet and seeks to make Cabinet accountable for its decisions subject to documenting the rationale. This provision is intended to relieve senior Civil Servants of the obligation to justify decisions of Cabinet. Mr. Speaker, the Office of Project Management and Procurement will collaborate with the Bermuda Economic Development Corporation and other groups to educate small and medium-sized business owners and entrepreneurs on the Government’s tendering requirements, and to make them aware of potential public sector contracting opportunities. Mr. Speaker, Honourable Members will already be aware that the Government has committed to seek the extension of the United Nations Convention Against Corruption to Bermuda. In order to meet certain requirements of the Convention, the Government will continue along the path to develop a new unified and comprehensive procurement legislative framework that replaces the relevant sections of the Public Treasury [Administration and Payments] Act 1969 and the Good Governance Acts of 2011 and 2012, respectively. Mr. Speaker, steps will be taken to commence implementation of the Code in the coming weeks. Implementation will commence with a clear training programme for Accounting Officers and Comptrollers. Subsequently, other public officers with responsibility for engaging in purchasing and tendering activities will receive instruction on the Code’s requirements. Mr. Speaker, since we became Government, we have worked tirelessly to put steps and safeguards in place to ensure that the integrity of the public office is upheld. This Government is committed to good governance, good government, and ensuring that the operations and financial affairs of all public authorities are open and transparent. Hard to argue with any of that although receiving a pen from a vendor is going to be overly burdensome…better to just give it back . Certainly tight requirements on Ministers. I would presume that all travel expenses from 18 July onwards are also going to be available on the Government website pronto. Seems that that piece of business is taking a long time and is now overdue. No mention of the penalties for failing to comply. Without penalties, nothing will change. Yep. Weak, toothless, pointless. That’s their idea of “reform”. Grand “codes” about nothing that they can ignore without repercussion. Penalties for breaking the code? We could start with 25 to life, $1.5 million fine. Well done to the Office of Project Management and Procurement for drafting and very patiently pushing these improvements through hoops since… was it 2011? Great work!